February is “Black History Month,” but when it comes to discovering their family history, some African Americans run into a roadblock because of slavery in the United States. NewsChannel 13's Elaine Houston has been wondering about her ancestors who were slaves and the impact they made on her family. Houston says she has lived a great life, traveled the world, wrote a book, produced documentaries, but she has never known who she really is -- that is, until now. Tara is proficient in English, Dutch, Flemish Dutch, French, German, Latin, Italian, and Spanish. She has over eight years of professional experience spanning the regions of North America, South America, Europe, and Western Asia ranging from the 18th to 20th centuries. This baptism record from 1883 came from the parish of San Sabino in present-day Gildone, Campobasso, Molise, Italy, and it helped our customer discover his ancestor was adopted a few days after his birth in 1883. In 1821 the town of Recale was under the rule of the Kingdom of Naples. Today Recale is part of present-day Caserta, Campania, Italia. This civil birth registration enabled our customer to visit the street where her ancestor was born. This picture of the Sant'Antonio Abate church located in the city of Campobasso, Molise, Italy was taken this year. The image enabled our customer to visit the present-day location where his ancestor was abandoned shortly after birth before he was adopted by a local family. This civil death registration from San Juan Evangelista, Veracruz-Llave, México confirmed that our client's ancestor died as a result of gunshot wounds in 1910. Roccapipirozzi was under the rule of the Kingdom of Naples in 1821 when this civil marriage registration was created. Today Roccapipirozzi is part of Isernia, Molise, Italia. This civil marriage registration record allowed our client to identify the parish where their ancestors were married. Our customer was able to visit the parish when she recently vacationed in Italy. The Aliens' report from the Surrogate Court of St. Lawrence County revealed to our client that her ancestors left Yorkshire, England and arrived at the United States in 1824. This civil birth registration is from Eeklo, Oost-Vlaanderen, Belgium. This document enabled our client to learn when and where her direct ancestor was born as well as who her parents were. 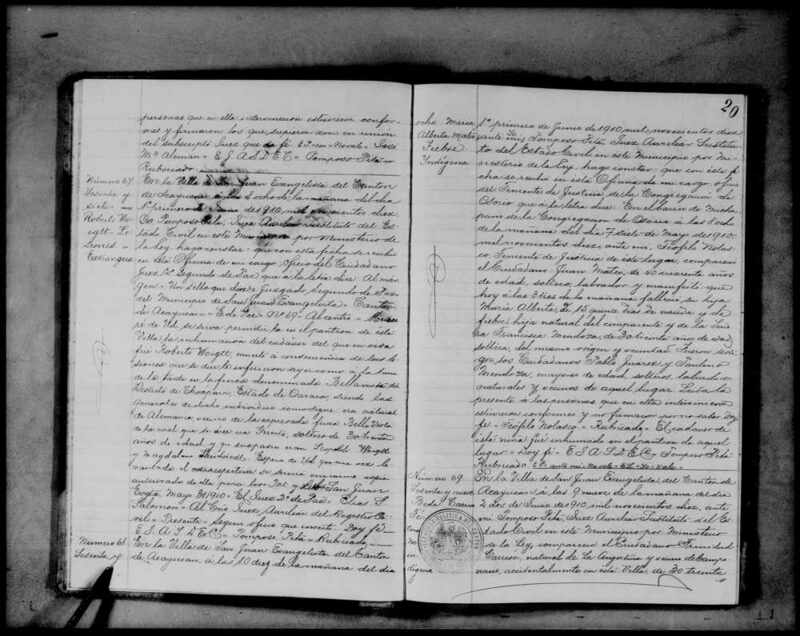 This civil marriage registration record is from México City, F.D., México and it allowed our customer to determine when and where his ancestor was married. This document also revealed more details about the identity of the bride and her parents. This civil marriage registration is from Roccapipirozzi and was created in 1818 when the town was under the rule of the Kingdom of Naples. The town is now is located in the province of Isernia and region of Molise in Italy. This document allowed our client to determine the parentage of his direct ancestors. This Catholic baptism certificate from Fürth, Darmstadt, Hessen, Germany revealed the exact date of birth of our client's ancestor in 1875. This civil birth registration from the turn of the 19th century is from Oaxaca, México. Without this document our client would not have been able to discover the identity of his ancestor's mother. This historic map illustrates all the land-owners living in Oswegatche, Saint Lawrence, New York, U.S.A in 1865. The land-owner map allowed our client to determine where their ancestor lived in town and it also helped him discover where his ancestor was buried. Thanks to a historic map from 1865 our client was able to find where his ancestor was buried in Oswegatchie, Saint Lawrence, New York. 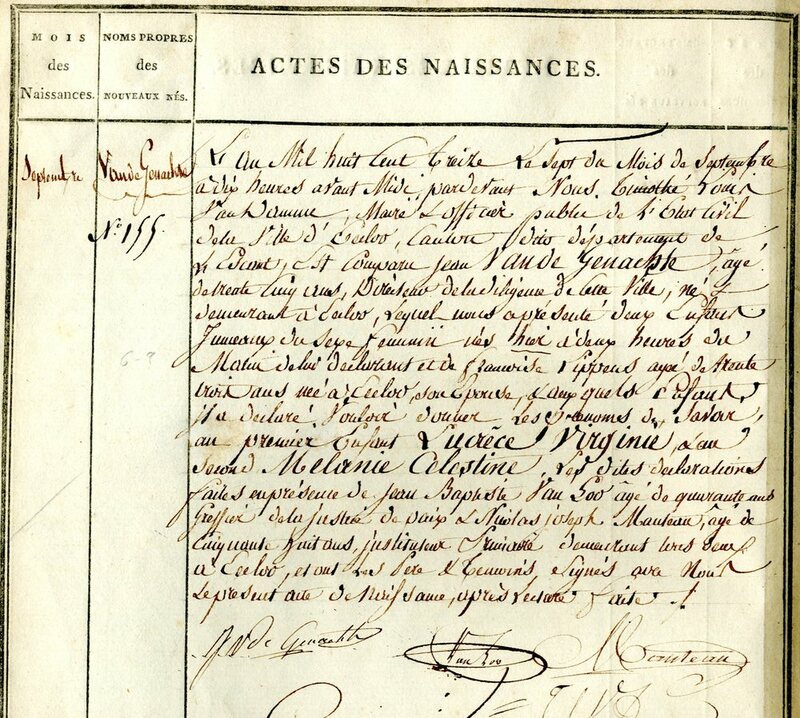 This civil marriage registration is from Lessines, Hainaut, Bruxelles, Belgium, and was created in 1896. Our customer was able to learn more about the identity of his director ancestor's siblings after this document was found. In 1813 this civil birth registration record was created in Eeklo, Oost-Vlaanderen, Belgium. Our client was able to learn the name, date of birth and parentage of one of his direct ancestors. This civil death registration from Fürth, Darmstadt, Hessen, Germany revealed to our client that her direct ancestor was a police man. It also enabled our customer to learn exactly where her family resided in Fürth, Darmstadt, Hessen, Germany at the end of the 19th century. This land deed from 1803 helped to confirm for our client that her direct ancestor resided in Charleston, Ontario, New York before his sudden death in 1805. This civil marriage registration record from 1873 was created in Trapani, Trapani, Sicilia, Italia. Without this document our client would not have been able to identify who her direct ancestors were that resided in the city of Trapani. In 1905 at Wiesbaden, Darmstadt, Hessen, Germany this civil birth registration was created. This document allowed our client to discover where her Germanic origins began. It also revealed that after her direct ancestor was born it took more than a week for his parents to give him a name. This civil marriage registration from Mezzojuso, Palermo, Sicilia, was created in 1876. The document gave us what we needed for our client to apply for Italian dual citizenship. In 1849 at Saint-Barthélemy, D'Autray, Quebec, Canada this civil marriage registration was created. This document helped our client better understand that her direct ancestor was not of Native American descent. In 1871 this civil marriage registration was created at Eeklo, Oost-Vlaanderen, Belgium. This record helped our customer discover the identities of her direct ancestors parents and grandparents. In 1905 at San Juan Evangelista, Veracruz-Llave, México this civil birth registration was created. Without this document out client would not have known their direct ancestor had a younger sibling. This birth civil registration record from Hayange, Moselles, Lorraine, France allowed our clients to determine exactly where their Polish ancestor was born in Hayange during the early 20th century. In the previous slide, we posted a birth civil registration record from Hayange, Moselles, Lorraine, France, and thanks to Google Maps our clients were able to locate the residence where their ancestor was born in present-day France. This civil birth registration record from Arpino, Frosinone, Lazio, Italia revealed the parish where our clients ancestor was baptized in 1826. Before this English census was found our clients did not realized their Irish ancestors lived and were born in Wednesbury, Staffordshire, England before they migrated to the United States. This Protestant baptismal register or 'Taufbuch' from Metterzimmern located today in the State of Bietighiem-Bissengen, Germany, revealed to our clients the exact date their ancestor was born in the year 1890. A land deed from 1803 was one of the few documents found on our clients ancestor from then Charleston, Ontario County, New York, which is now present-day Lima, Livingston County, New York. 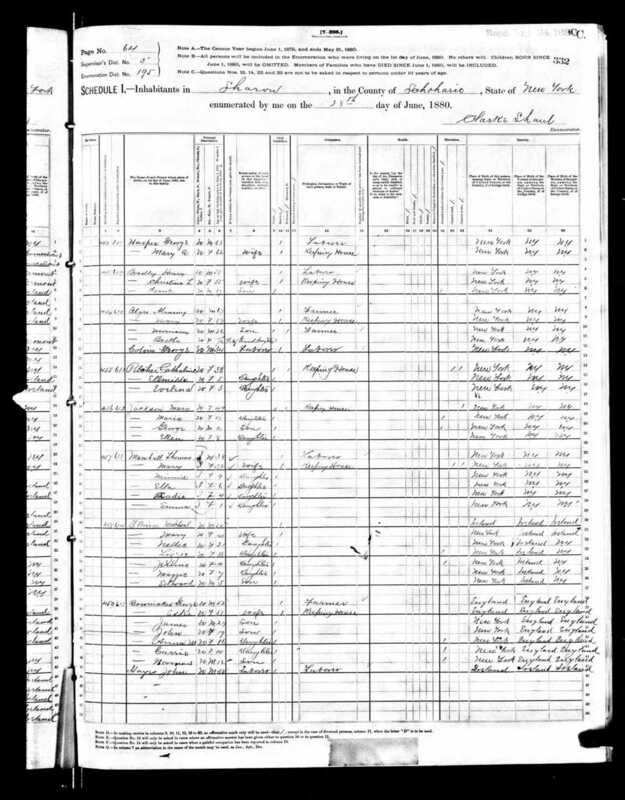 This census record from 1880 revealed to our client that his ancestor was of Native American descent because the race of the family was noted as, 'Indian'. While many genealogist charge a fee to complete an initial case review, Capital Genealogy has always provided a thorough research audit and initial case review free of charge. Included with every Initial Consultation Report is a detailed description of your starting point, an analysis of potential research strategies and an itemized quote with specific research tasks. Please click here to fill out our welcome form and start a project today! Personal one-on-one attention throughout the research process with flexible phone appointments and correspondence with Tara that are always included free of charge. Many aspects of Tara’s work are included free of charge including detailed document analysis, an online document appendix hosted by Evernote, as well as written and verbal research reports.